Like you, I crowd in more veggies, healthy fats, lean protein (with the exception of red meat), fruits, and beans that will have a positive effect on my health conditions. I working to keep improving on those. Thank you for the welcome and the best on your journey, too! There's no length of time with the mediterranean way of eating. Actually, I used the term "diet" only because of the labeling that is done to differentiate it from other "diets". It's a way of eating that has been around for centuries.I can pretty much eat from all food groups with the exception of avoidance of sugar-sweetened beverages, added sugars, processed meat, refined grains, refined oils and other highly processed foods. This way of eating is very sustainable from my research which is of utmost importance to me. I am not looking for temporary ways of eating...fitness training is a consistent part of my life and has been for years so it was just time for me to tweak my food selections, too. So glad you've joined the team. I've never tried the mediterranean diet. How long did you do that diet? Glad to hear you are changing your eating journey. I too am an advocate of the Mediterranean diet and have upped my intake of good fats using EVOO, nuts, avocados and introducing chia, hemp, flax seeds as well as nutritional yeast. My name is Pamela and joined this team because I am gradually changing my way of eating for overall health, fitness, and wellness. I am 64 years old diagnosed with HBP (controlled with small does of med) a few years ago and most recently as Pre-diabetic. My health is very important to me and when I make changes so does my family. 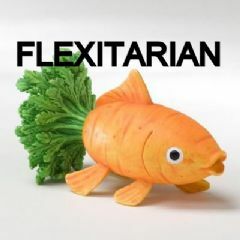 I'd never heard of Flexitarian but it fits perfectly. It reminds me of the Mediterranean Diet which is a good way to eat, sustainable. I hope to learn from each of your experiences going forward.